Robert Wright’s Instagram bio simply reads “escape artist,” and he’s good at it. His last gig as Soludos’ director of marketing took him ’round the world—India, Morocco, France, Portugal—and now that the New Yorker is running his own global wanderings-inspired brand, he’ll be racking up even more miles. 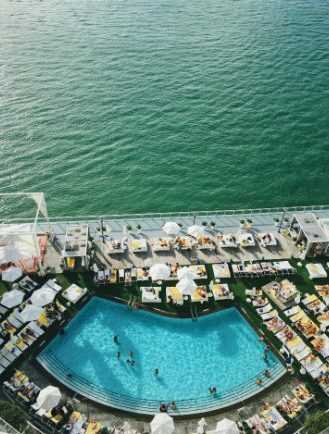 A Miami, Florida regular, he dishes on all his fave places in the city. 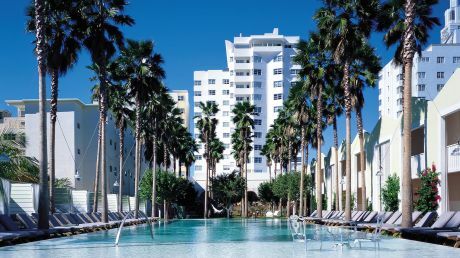 The best way to sum up a stay at the 1 Hotel South Beach? You feel better about yourself after check out. There’s triple-filtered water on tap in each guestroom, healthy and delicious poolside menus, walls of lush foliage, biodegradable room keys and a naturally lit, Crossfit-inspired gym. 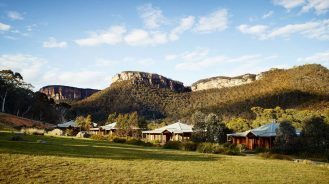 The eco-friendly perks are sure to reduce any guilt from hotel pampering, right alongside your shrinking carbon footprint. 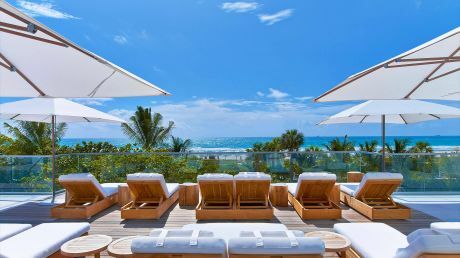 A buzzing pool scene—and those iconic yellow towels—keep Mondrian South Beach, a Philippe Starck-designed hotel, feeling fresh and relevant. Its bayside location means stunning sunsets and celebrity home-spotting (exclusive Star Island is peep-able from your chaise lounger). Insider tip: order the frozen fruit platter while poolside—it’s a refreshing mix of icy, super exotic fruits that will cool you down in a jiffy. For a first hand look at Miami’s enduring Cuban culture, head to the park on the corner of Calle Ocho and 15th Avenue. Filled with the clattering of dominos and local characters, the park is a charming slice of local life and a stone’s throw from the old school bar Ball & Chain (founded in 1935), Azucar Ice Cream parlor and Tower Theater. Located on Calle Ocho across from Domino Park, Tower Theater is one of Miami’s cultural touchstones. Spotless and beautifully renovated, it features an edited selection of critical favorites. Follow up a flick here with a ojito across the street at historic Ball & Chain bar or a cone of Cuban-inspired ice cream at Azucar. 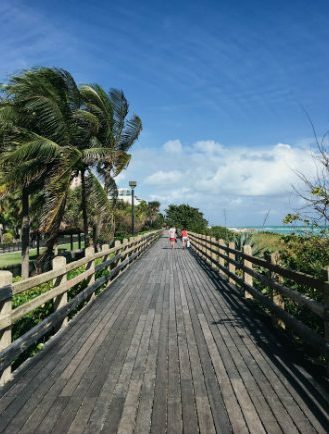 No trip to South Beach is complete without a stroll along the South Beach Boardwalk. South Florida’s answer to Ipanema Beach’s iconic sidewalk or Santa Monica’s seaside boulevard, you’ll see all walks of life jog, walk, run, skate and bike by on your morning strut. This once forlorn industrial neighborhood has undergone a renaissance that keeps gathering steam. Its multicolored heart lies at the buzzing Panther Coffee. 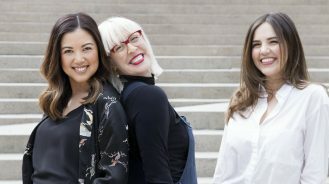 A stop by on a recent weekday afternoon saw lines out the door and a mix of both local creatives and in-the-know international tourists. 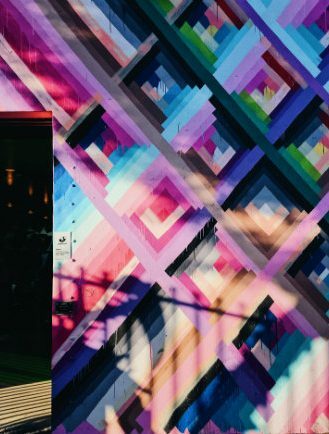 Start your day here with an iced cappuccino and then wander in any direction to find stunning graffiti murals at every turn, boutique shopping from the coolest brands in town, and the best of Miami’s culinary scene. The most glittering addition to Miami’s cultural scene in recent years, PAMM is a must see. If you’re short on time, at least swing by for a walk under the inspiring hanging gardens that dot the corners of the building. They’ve grown in to full effect over the last few years. You can grab a snack or full meal at the museum’s concrete-chic Verde café. Adirondack chairs positioned under the towers of green are perfect for a post-cultural coffee. Shuttered for renovation until Spring 2017, the grounds of the coral stone-clad Bass Museum are still worth a look. 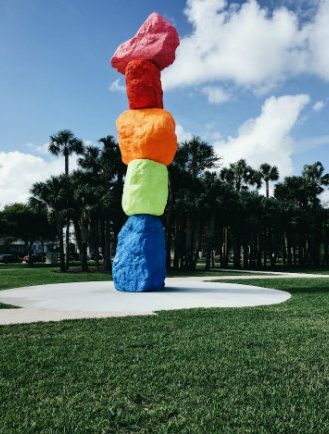 Situated just off South Beach, its modern and colorful art sculptures fill the park. Once reopened, the relatively small scale makes this museum a perfect morning detour before hitting the beach. A beloved stop in the glamorous seaside town of Punta del Este is Uruguay’s seafood heavy Parador La Huella restaurant. 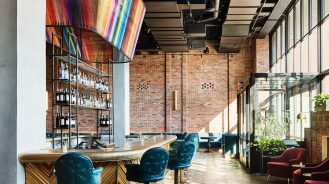 Luckily, their first stateside outpost, Quinto La Huella, has just landed in Miami’s Brickell neighborhood. 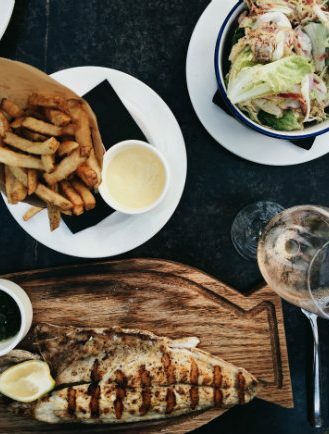 A neutral-on-neutral mix of comfortable furniture and expansive outdoor terraces sets the scene for the star of the show: whole grilled fish cooked in the restaurant’s wood burning oven. 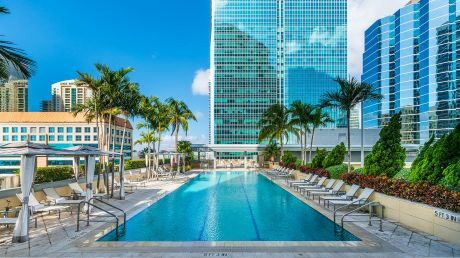 Located inside the East Hotel, the restaurant is part of the massive new Brickell City Center development that is reshaping the face of Miami’s downtown. Don’t forget to take a light speed-inspired selfie in the elevator on the way up to the fifth floor. 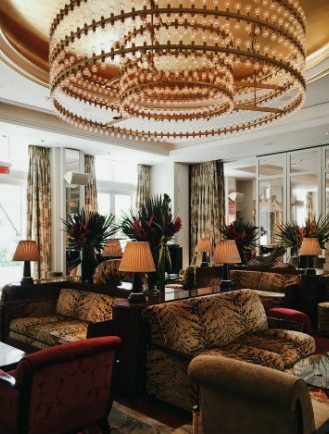 For some good old over the top Miami glitz, head to South Beach’s Faena hotel. A riotous mix of palm print, gold leaf and animal print makes for a very glamorous night on the town. Doing some damage at the luxury emporiums lining the newly scrubbed streets of Miami’s Design District? You’ll need to fuel up for the task at hand, and there’s no better place than Michael’s Genuine. 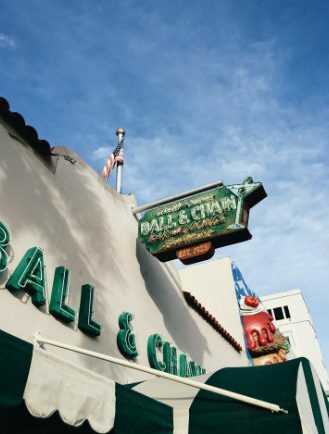 A neighborhood stalwart since before it was cool, it’s guaranteed good people watching and guaranteed good grub. 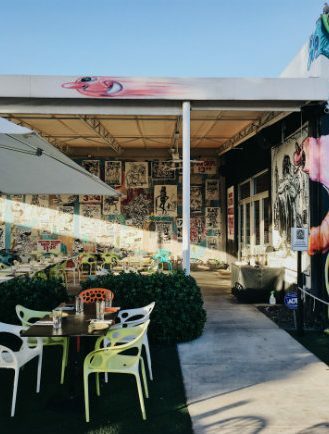 For the best burger in town, head to the Wynwood Diner, a brightly-colored restaurant smack in the middle of the Wynwood Arts District. 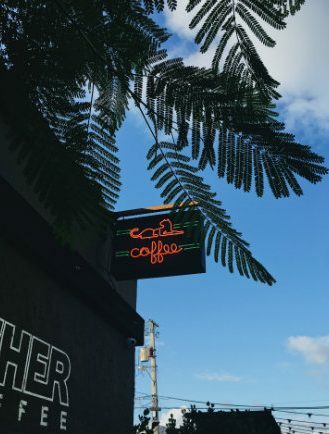 Panther has taken over Miami’s café scene. Starting from their original perch in Wynwood, the brand’s beans are now roasted at the coolest hotels and cafes in town. Their original location is hopping nearly all hours. Its large, shady sidewalk terrace is the perfect spot to watch the artsy crowd stroll by. Oh, and the coffee happens to be delicious. The go-to in Wynwood for freshly made tacos, Coyo Taco is a sharp blue and white space. A hidden bar in the back makes this spot a perfect hang out. 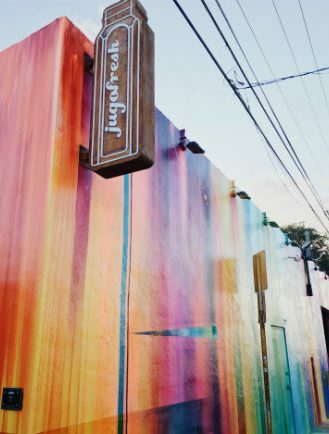 Smack in the middle of the original Wynwood Wall murals, Wynwood Kitchen & Bar has become a Miami institution. Grab a seat on one of the colorful café chairs to enjoy a menu of delicious tapas in the shadow of the neighborhood’s most iconic art pieces. Just watch out for stray selfie sticks. All of the biggest names in luxury—Hermes, Chanel, Dior, Saint Laurent, Prada—have opened gleaming, gorgeous flagship stores in the formerly derelict Design District. 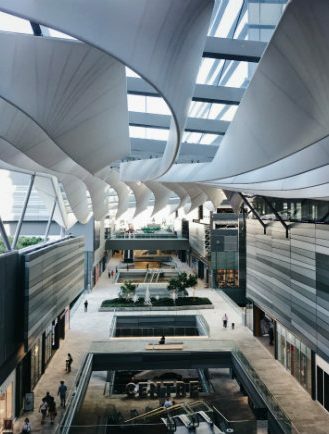 Freed from space constraints in Bal Harbour Shops, the brands’ new stores are worth seeing for their stunning architectural design alone. There are only two main streets here, so it’s easy to power through in a couple hours. 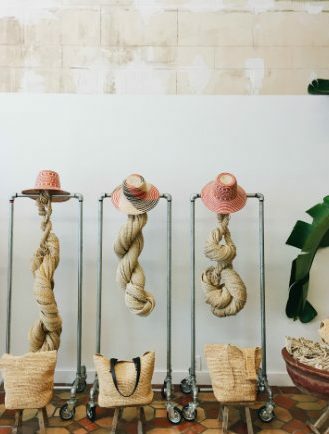 For a well-curated selection of goodies including candles, clothing, luggage and accessories, it doesn’t get better than the boutique in the lobby of the Miami Beach Edition. Pick up limited edition items that are designed by brands such as Herschel and Nixon, most of them only available here. A massive addition to Miami’s shopping scene, Brickell City Center is not only home to Quinto la Huella (see above), but also a dizzying list of today’s best brands. A lazy lunch is the perfect precursor to an early evening shopping excursion. Don’t miss the first Miami outpost of Florence-based Santa Maria Novella, the world’s oldest surviving pharmacy. Miami’s local independent bookstore is thriving. 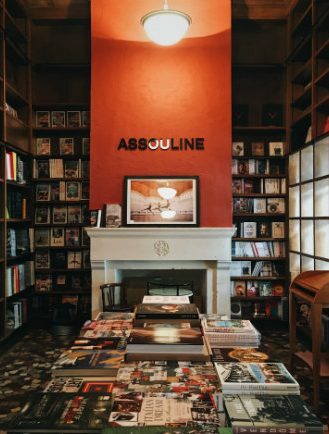 Books & Books‘ Coral Gables location features curated store-in-stores from heavyweights Assouline and Taschen, providing hours of high-end browsing material. Super knowledgeable staff make the difference here. 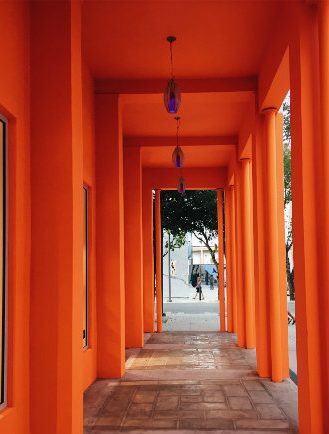 A recent addition to Miami’s evolving downtown, Neushop is an Instagrammer’s paradise. Perfectly merchandised clothing, housewares and stationery are arranged by color on industrial furniture in a soaring space. I couldn’t resist snagging some lightly-lined Japanese notebooks and colorful Kaweco pencils. All of the cool girl and guy brands are crowding into Wynwood’s colorfully painted streets. Among them are Shinola, Illesteva and Aesop. Grab an iced coffee from Panther before dropping some cash at the brightest shops in all of Miami—and that’s saying something. In need of a last minute gift? 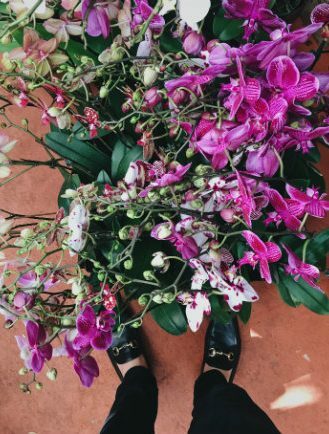 Miami’s roads are lined with pop up flower stands selling beautiful orchids and bromeliads at bargain prices (especially for those of us from the Northeast). Famous for his very original cycling outfit, Miami’s naked biker has become something of local celebrity. Keep an eye out…or don’t. I seemingly couldn’t miss him this last time around. Lagging behind but working hard to catch up with the rest of town, Downtown Miami is sprouting a growing number of construction cranes. 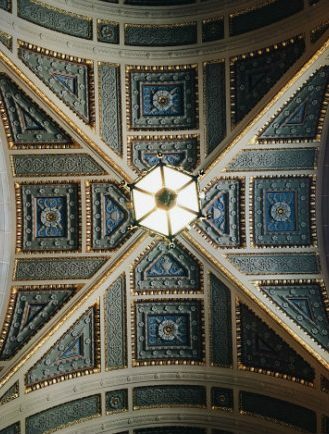 Alongside the new cafes and shops, you’ll find a number of architectural gems including the Italian Renaissance-style Ingraham Building and the Alfred I. DuPont building—a late ’30s building with stunning Art Deco details. The historic Seybold Building is home to the highest concentration of gold, silver and gemstone dealers in Miami. When my necklace snagged and broke on my first day, the jewelers on the top floor here had me fixed up in no time.